Did you know Norfolk County has lost roughly 73% of its wetlands? Long Point Basin Land Trust is asking for your help to conserve a portion of Venison Creek and protect this cold water stream. Long Point Basin Land Trust has a significant and exciting opportunity to purchase, protect and restore an environmentally significant and ecologically strategic property within the Venison Creek Watershed in Norfolk County. LPBLT is excited to report that an agreement has been negotiated to purchase the property, conditional on securing sufficient funds to close the deal byJanuary 31, 2018. The total project cost is $492,307; currently, we have more than half of the required funding confirmed and/or pledged. WE NEED YOUR HELP TO RAISE THE $130,000 NEEDED TO SECURE THE PURCHASE! 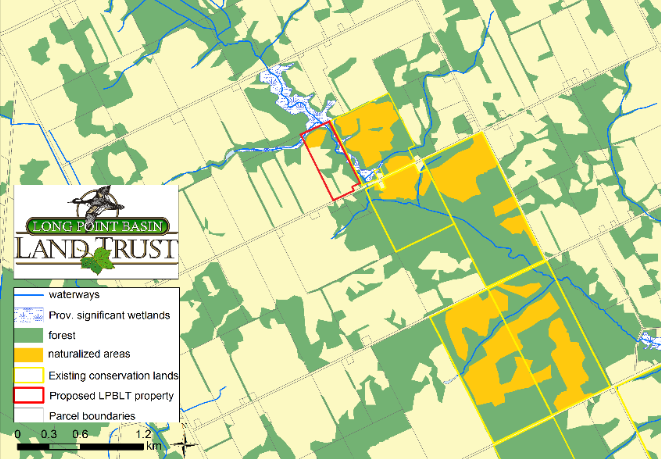 The acquisition of this property by LPBLT will contribute to building and preserving vital ecological corridors and linkages with other conservation lands in the Venison Creek Watershed. We are reaching out to individual supporters like yourself to secure the additional funds required to acquire this vital property situated in the heart of Carolinian Canada. We hope you can help by making a donation either through the CanadaHelps website or by sending a cheque to P.O. Box 468, Port Rowan, Ontario, N0E 1M0. Any amount you give will help to conserve this ecological “anchor” along the cold water creek system and safeguard the waters of Venison Creek.